Insufficient evidence has been found in 36 out of 37 investigations into recent allegations that police covered up child abuse in the past. Investigations overseen by the Independent Office For Police Conduct were disclosed to the Independent Inquiry into Child Sexual Abuse. It's the first time the results of the long-running series of investigations have been made public. In one case evidence was found, but the officer has since died. The report by the IOPC says a string of claims made during recent years - by retired police officers, social workers and journalists - were not supported by available evidence. Often the allegation was that senior officers stopped an inquiry after finding out that prominent people were involved. Some of the claims were widely reported in the media. The cases largely date back to the 1970s, 1980s and early 1990s. In 23 cases, no evidence at all was found of the allegation. In eight of these cases, this was because relevant information could not be obtained. In the other 15, evidence was discovered which undermined the claims. In the remaining cases insufficient evidence was found. In just one case evidence was found to support a claim: that in the 1980s, a senior police officer entered a cell containing property seized in Operation Circus, an inquiry into child abuse in Piccadilly and London stations. The officer has since died, meaning no further action can be taken. An anonymous letter was sent to the Metropolitan Police in 2015 claiming to be from a retired officer at Aldgate police station. It said an investigation into sexual abuse and corruption among prominent people in the 1970s and 1980s was dropped. An investigation in 2015 found there was no such police station and the letter used language unlikely to have come from someone who had served as a police officer. The sender of the letter was not traced. A former children's home manager claimed high-profile people were involved in abuse from 1986 to 1987. She met police at Wimbledon at the time and says she was told to report anything unusual. She then said she was later told to forget what she was told and the case was closed. No living person could be found who could substantiate rumours that subsequently spread that the case was closed due to links with Westminster. A care worker claimed high-profile people attended Elm Guest House in south-west London, where abuse was said to have taken place. He said he was visited in 1989 by two men with guns, who were Special Branch officers. He said three shots were fired through his kitchen window. The care worker gave two statements which contained significant inconsistencies. The Independent Inquiry into Child Sexual Abuse (IICSA) in England and Wales is investigating claims against local authorities, religious organisations, the armed forces and public and private institutions - as well as people in the public eye. 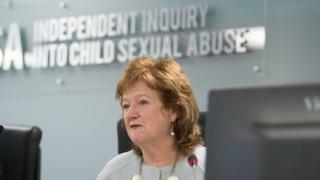 The inquiry is being led by Prof Alexis Jay, a former director of social services who headed the inquiry into child sexual exploitation in Rotherham. The inquiry's public hearings consist of 13 separate investigations, which are expected to last until 2020.